Théodore Lemonnier Fine and Large Oil on Canvas "Le Sérénade"
Walter Pach (1883-1958) watercolor and pencil drawing of a reclining tiger. Signed Walter Pach and dated in upper left. Inscribed '26' lower left and inscribed on the back of frame "For Nikifora from Walter" and 'Property Nikifora L. Pach, W.F. 1953." Some minor wear to the frame. Sight size: 10.25" x 14.13". 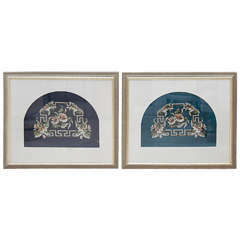 Framed Victorian beadwork in gilded frames. One with cobalt blue beadwork ground and the other with deep turquoise beadwork ground. Flowers and geometric decoration. 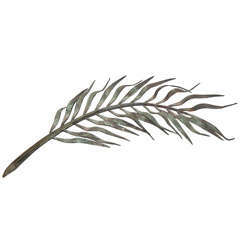 Palm frond wall or tabletop decoration in patinated bronze from Colefax & Fowler. Signed Jean Rabiant Memorial Frond. 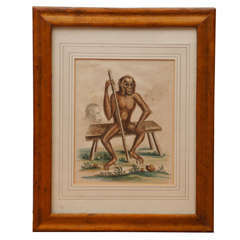 Unsigned oil and watercolor on fine art paper. Framed in simple wood frame. Vintage paint and ephemera artwork. Custom contemporary frame. An abstract artwork signed illegibly and dated '68 to the lower left.